Yahoo managed to beat low investor expectations by a slim margin yesterday and was rewarded with a short bump this morning that has already burned off. Yahoo’s non-GAAP earnings per share totaled $0.38 during the quarter on revenue of $1.08 billion. For all the media scrutiny that Yahoo receives, its financial performance feels almost uninvestigated. And, on those results, Yahoo beat street expectations. The simple retort to the negative view of Yahoo’s financial performance is that its mobile strategy has yet to bear fruit – that once mature, its bets on mobile will drive the company’s revenue forward. The issue with that reasoning – aside from it being all too polite, please – is that I think we are seeing signs that Yahoo’s mobile strategy is working, but not as well as the company, or perhaps we externally, had hoped or expected. As part of its earnings, Yahoo announced that it now has 390 million monthly active mobile users. That’s up from the 350 million figure that its CEO Marissa Mayer quoted at the recent TechCrunch Disrupt conference. Yahoo was at the 300 million monthly active mobile user mark in the first quarter of this year, so in less than a year, it’s picked up nearly 100 million monthly active mobile users. This is to the credit of both Mayer and her staff. Mayer’s mobile focus and wildly aggressive acquisition strategy, combined with corporate refocus, have allowed for the growth. Yahoo mobile products pre-Mayer weren’t very good. There has been much improvement. Now, what you would expect to see following a large run-up in usership is that Yahoo would sell more ads. More users mean more usage which means more sessions which means more ads, right? Correct! The massive expansion of Yahoo’s mobile user base has coincided with a decline in the rate of decline of its total ads served per quarter. In its most recent quarter, Yahoo managed to grow the number of ads that it served for the first time in recent memory. 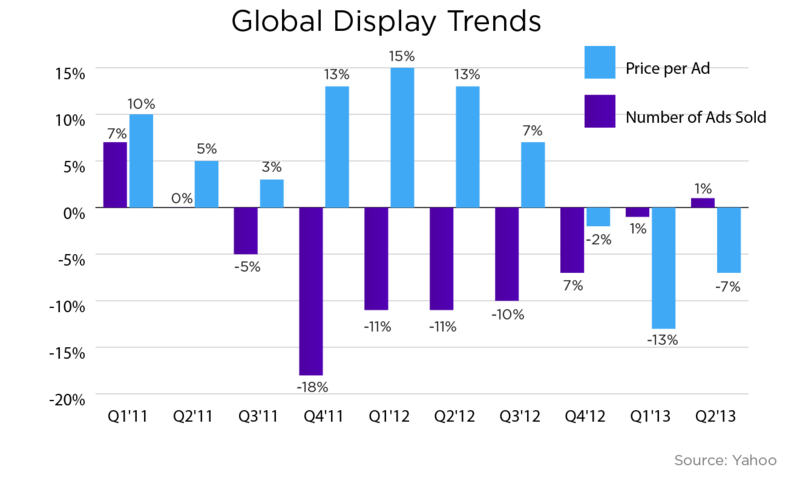 As you can see, through 2013, Yahoo has stanched what was a double-digit quarterly decline in its sold ads per quarter. This is, of course, good news. The kicker is that a pillar of Yahoo earnings durability has been lost: Price-per-ad strength. What could cause that sort of decline in the per-ad price that Yahoo commands? Well, if there were a large influx of lower-priced ad inventory into Yahoo’s larger ad sell-through, that would do the trick. Say, a truckload of new mobile advertisements. You might be thinking at this point that we’ve made a mistake: If Yahoo’s goal was to drive mobile usage, and sell more ads, then how has it failed? Well, we need to be reminded that Yahoo’s mobile incomes must replace declines in its larger display and search businesses. GAAP display revenue was $470 million for the third quarter of 2013, a 7-percent decrease compared to $506 million for the third quarter of 2012. Display revenue ex-TAC was $421 million for the third quarter of 2013, a 7-percent decrease compared to $452 million for the third quarter of 2012. Even with the first-in-eight-quarters increase in total ads sold, Yahoo saw declining year-over-year income from its ad business on a GAAP basis. Therefore, if we judge as we have that Yahoo has managed to execute its mobile strategy of using growing mobile usership to expand its sold ads base, we can also come to the conclusion that it will have to reach a scale far greater than its current tally to stop, let alone reverse, its current revenue declines. If revenue doesn’t beat expectations, and things are middling, we’ll hear the usual miasma of “we remain optimistic” and “our metrics are on par with our expectations” and something close to “stay the course.” But what would be encouraging would be a revenue beat on the back of rising mobile usage. Such a result would be the strongest possible validation of CEO Mayer’s strategy for the company as sound and operational. With the new metrics of 390 million monthly active mobile users, and the fact that ad sales are growing at last, it would be incorrect to say that Mayer’s bet for Yahoo is wrong. But I think that it is also fair to say that it’s a gambit that will play out over years, and not quarters. Happily for the company’s sake, investors appear mostly content with its flat performance. How much patience they have, however, remains to be seen.